This CD is particularly interesting as it exclusively contains - except for the Sonata ?1 by G. Bantshikov from 1977 - oeuvres for bayan written in 21st century. Composer G. Bantshikov from Petersburg is one of Russia's most important composers. He composed operas, ballets, symhonies, cantatas for choirs, and chamber music for various instruments among which you find four sonatas for bayan. Sonata ?1 was written in 1977 and is dedicated to O. Sharov. In the first movement two metaphorical spheres are confronted with each other: a rhythmical, vibrating and somehow mysterious ostinato-line, accompanied by the left hand, and a peaceful and idyllic melody by the right hand. However, both lines gradually develop a somewhat excited character which is only interrupted by clusters. The whole movement is based on this musical structure. The second movement presents a fugato. The theme by and by develops out of minor thirds and evokes a sad and melancholic mood which gradually conquers the tonal cosmos. The theme in the third movement remotely reminds of a pastoral melody although it shows quite aggressive features. The central episode finally reaches its climax in the evil march, the whole sonata heading for its culmination. A chain of clusters disrupts the sinister procession, and forms - like the clusters in the first movement - the frame of the whole sonata. A.Cholminov is another great Russian composer of the 20th century. Apart from numerous operas, symphonies, oeuvres for choir and chamber music, he wrote the very simple but profound and heartbreakingly beautiful melody for the film "Predsedatyel" ("The Chairman") - and that using only two notes. In the film it is played on bayan. Cholminov uses this melody in his "Autumn melody", and - in my opinion - he succeeded perfectly in creating a masterpiece. The phantasy, deep and emotional, is perfectly constructed and shows - which is essential - a rather high-pitched and rich intonation. Such a gorgeous oeuvre could only be created by a real maestro. 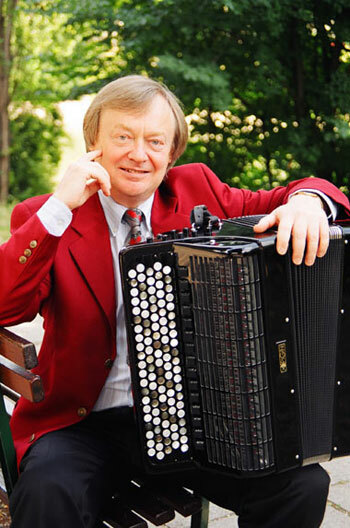 The outstanding Russian composer R.Ledenyov, professor at the Moscovite Conservatory, worked on a cycle of oeuvres for bayan entitled "
on the background of the Russian landscape". "Evening love ditties" is the 2nd oeuvre of this cycle. According to the composer's own words, he wanted to show what is going on in a village when the young people gather after a day of hard work, in order to relax and have fun. Lyric melodies alternate with - sometimes - quite lively folk dances. The sonata by E.Podgaits, one of the most important Russian composers of the middle generation, was written on my suggestion. It is, classically, divided into three parts. Fact is that today sonatas often consist of only one movement. Podgaits always develops the first movement according to the structures of traditional sonatas, and it is rich in rare rhythms and shows a sophisticated structure. The basic idea of the 2nd movement concentrates on using the "bisbigliando" on the bayan. This method of playing is mainly used with instruments and demands to repeat the same note using different fingerings. On the bayan the composer uses the bisbigliando for repeating the same note by changing into different timbres (registers). In the 3rd movement he mainly uses the five-part ricochet, which makes the final - besides some other aspects of interpretation techniques - an outstanding end of the cycle. 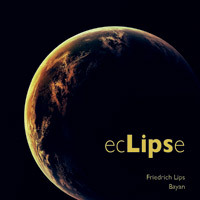 M.Bronner, the phenomenal composer of great symphonies, choir- and chamber music oeuvres, as well as various ones for bayan, has, following my request, written a piece entitled "Eclipse". He liked the title at once: "You understand, Friedrich, for me the title of a piece of music is half the oeuvre. 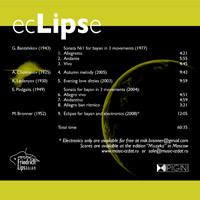 By the way, why "Eclipse"? - So I told him that my family name is part of it. In this oeuvre the soul and its confusion make up the central part. At the same time, the phonogram of lively nature used at the recording depicts a real natural phenomenon, even a disaster is possible. However, everything calms down finally, and because of his touching discovery (the smile of a child) the composer tells us in the end: "No matter what, life goes on..."